To date, remarkably little research attention has been paid to the development of Jewish beliefs and rituals about illness and death. 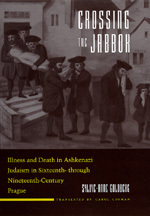 Crossing the Jabbok presents an illuminating study of such views and practices among Ashkenazi Jews (1500s-1800s) and is one of the first works to apply history of mentalités methods to a topic in Jewish cultural studies. Focusing on Prague, then the center of Central and Western European Jewry, the author draws on a rich array of materials to explore what was distinctively Jewish about the approach of Jews to sickness and dying. Her discoveries shed new light on the institution of the hevra kaddisha, or burial society, and many existing customs. Sylvie-Anne Goldberg is Associate Professor at the Center for Historical Research, L'Ecole des Hautes Etudes en Sciences Sociales, Paris. Carol Cosman is a freelance translator.